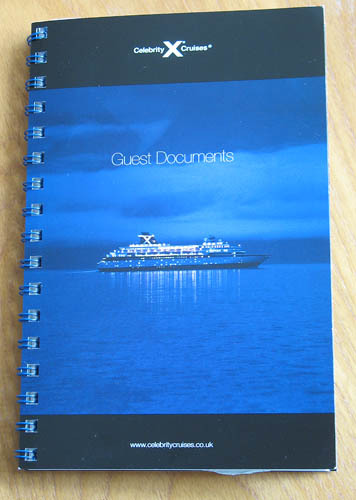 It’s astonishing how much excitement a small spiral-bound booklet can deliver. Of course it was necessary to read it immediately from front to back, and then back again (well, apart from the legal stuff on pages 19, 20 & 21 – I know I ought to look at that but somehow I never get past line 2). It all looks right: they’ve got our names right, the right cruise dates, the right cabin (which means that the Upgrade Fairy has not waved her wand over me), the right sitting for dinner, and the right excursions. Whew!- looks we’re going on a cruise. The only dilemna comes with the flight arrangements. We have a direct outbound flight from London to Rome – we specifically asked for this (and paid a bit extra) because last year we shared a table with a lovely couple from Merseyside who flew from a regional airport to Rome via Paris where their luggage went astray, and it was three days into the cruise before it caught up with them. But going home we are with a different airline, Lufthansa, and going via Frankfurt. It’s not the change at Frankfurt that has us a bit nonplussed, it’s the different baggage allowances that is causing us some problems. Because these are all flights within Europe we are limited to one checked-in bag each, with a low weight limit; 23kgs with BA but only 20kgs with Lufthansa. Last year we really needed the 23 kgs – the bags weighed in at 21.5 and 22.5 kgs when we checked in. This is going to be a problem! Watch this space for news on what we do…. I feel your pain. We’re flying Easyjet post-cruise and how, tell me, am I to fit my goodies from the Grand Bazaar into a bag that’s meant to weight no more than 20 kilos?